Florence is a 3rd-class city in Boone County, Kentucky, in the United States. Florence is part of the Cincinnati/Northern Kentucky metropolitan area. The population was 29,951 at the 2010 census. The Florence area was originally known as Crossroads, because of the convergence of several roads from Burlington and Union at Ridge Road (now U.S. 25). By 1821, the area was known as Maddentown for Thomas Madden, a Covington attorney who owned a farm on the Burlington Pike. When Madden moved away, the area became known as Connersville in 1828 for Jacob Conner, a settler who assumed responsibility for the growing town. The town was finally renamed to Florence owing to another Connersville in Harrison County. It presumably honors Florence, Italy, but the specific etymology is unclear. It was incorporated on January 27, 1830, and grew quickly after the completion of the Covington-Lexington Turnpike in 1836. Florence is located in eastern Boone County at 38°59′36″N 84°38′33″W﻿ / ﻿38.99333, -84.6425 (38.993225, -84.642602). U.S. Routes 25, 42, and 127 pass through the center of Florence, leading northeast in a concurrency 11 miles (18 km) to downtown Cincinnati. Interstates 75 and 71 pass through the western part of Florence, with access from exits 178 through 182. According to the United States Census Bureau, the city has a total area of 10.3 square miles (26.8 km2), of which 10.3 square miles (26.7 km2) is land and 0.04 square miles (0.1 km2), or 0.43%, is water. As of the census of 2000, there were 23,551 people, 9,640 households, and 6,073 families residing in the city. The population density was 2,385.6 per square mile (921.1 /km2). There were 10,322 housing units at an average density of 1,045.6 per square mile (403.7 /km2). The racial makeup of the city was 92.44% White, 2.67% African American, 0.26% Native American, 1.50% Asian, 0.06% Pacific Islander, 1.58% from other races, and 1.49% from two or more races. Hispanic or Latino of any race were 3.80% of the population. There were 9,640 households, of which 32.1% had children under the age of 18 living with them, 46.2% were married couples living together, 12.8% had a female householder with no husband present, and 37.0% were non-families. 30.2% of all households were made up of individuals and 11.1% had someone living alone who was 65 years of age or older. The average household size was 2.41 and the average family size was 3.03. 24.9% of the population was under the age of 18, 10.7% from 18 to 24, 33.0% from 25 to 44, 19.6% from 45 to 64, and 11.8% who were 65 years of age or older. The median age was 33 years. For every 100 females there were 90.4 males. For every 100 females age 18 and over, there were 86.7 males. The median income for a household in the city was $42,567, and the median income for a family was $52,160. Males had a median income of $36,677 versus $26,323 for females. The per capita income for the city was $20,451. About 8.1% of families and 9.5% of the population were below the poverty line, including 11.5% of those under age 18 and 14.0% of those age 65 or over. In terms of population, Florence gained 2.2% over one year and gained 14.2% over the course of the decade. As of June 2008, the city's population was 27,745 citizens. It is the sixth largest city in the Cincinnati/Northern Kentucky metropolitan area. 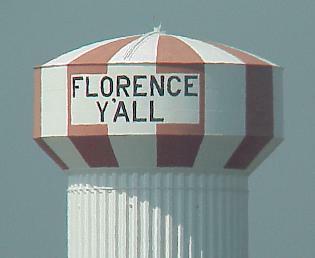 Florence is well known in surrounding cities for a water tower visible from I-75 that reads "Florence Y'all". Originally the tower advertised the up-and-coming Florence Mall, as part of an agreement by the mall developers who donated the land for the tower. However, because the mall was not built yet, the tower violated highway regulations, and the city was forced to change it within a short deadline. Rather than repaint the entire tower, they simply painted over the two vertical lines of the "M" to create a "Y". The intent was to change it back when the mall was built, but the local residents liked the tower's new proclamation, so the city decided to leave it as it was. The city is home to the Florence Freedom independent minor league baseball team. The Freedom have played at Champion Window Field which is now UC Health Field in Florence since the venue's completion in 2004. ^ a b "Geographic Identifiers: 2010 Demographic Profile Data (G001): Florence city, Kentucky". U.S. Census Bureau, American Factfinder. http://factfinder2.census.gov/bkmk/table/1.0/en/DEC/10_DP/G001/1600000US2127982. Retrieved November 20, 2013. ^ Kleber, John (ed.) The Kentucky Encyclopedia. "Florence". University Press of Kentucky (Lexington), 1992. ^ Rennick, Robert M. (1987). "Kentucky Place Names". University Press of Kentucky. p. 104. http://books.google.com/books?id=3Lac2FUSj_oC&pg=PA104. Retrieved 28 Apr 2013. ^ Boone County Historical Society. "Florence, Boone County, Kentucky". B.C.H.S. (Florence), 1958. ^ "Retrieved on 2010-1-8". Census.gov. http://www.census.gov/prod/www/abs/decennial/. Retrieved 2014-06-02. This page uses content from the English language Wikipedia. The original content was at Florence, Kentucky. The list of authors can be seen in the page history. As with this Familypedia wiki, the content of Wikipedia is available under the Creative Commons License.